American landscapes are forever changing as we face the loss of some of our most iconic game bird species. 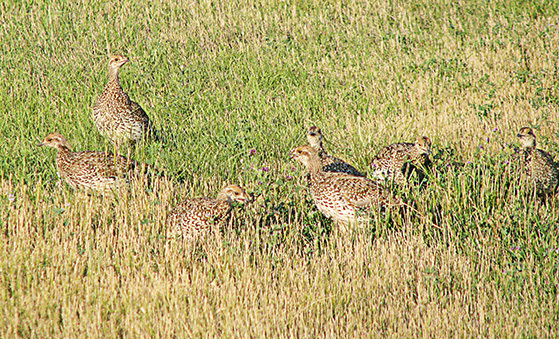 Upland birds are among the fastest and most consistently declining bird populations in North America and grassland and prairie habitats are the fastest disappearing habitats in the US. Last year, the Gunnison sage grouse and Lesser Prairie-chicken were listed as threatened under the Endangered Species Act. The Greater Sage Grouse, Greater Prairie-chicken, Sooty Grouse, and Northern Bobwhite have experienced a 40% rate of decline in the last 40 years. Scaled Quail and Sharp-tailed Grouse are also showing steep declines with loss of habitat being the primary cause and ultimate solution. The Federal Upland Stamp is a proposed conservation program similar to the Federal Duck Stamp, which is a license required for hunting migratory waterfowl and is considered one of the most successful conservation programs ever initiated. An upland stamp does not just provide funds toward improving upland habitat, it includes an educational aspect and opportunity to highlight the cultural value of upland game species to broader audiences. Join us in calling for the creation of the Federal Upland Stamp and be a part of conservation and grassroots history by signing the petition today. To read the article “It’s Time for the Federal Upland Stamp, click here. © 2015 Ultimate Upland, LLC – Support for the Federal Upland Stamp means support for upland habitat and birds. We believe the upland hunting community carries a wide range of experience and knowledge and must lead the conversation on conservation issues. The Federal Upland Stamp is our first priority. Upland bird art courtesy of Shari Erickson.